One of the most successful franchises in professional sports history, the New York Yankees have won 18 division titles, 40 AL pennants, and 27 World Series championships, all of which are MLB records. According to Forbes, in 2013, the Yankees are the highest valued sports franchise in the United States, and fourth in the world, with an estimated value of approximately $2.3 billion.Due in part to their success, the Yankees have garnered enormous popularity worldwide and a dedicated fanbase, as well as widespread enmity from fans of other MLB teams; the Yankees' rivalry with the Boston Red Sox is one of the most well-known rivalries in sports. 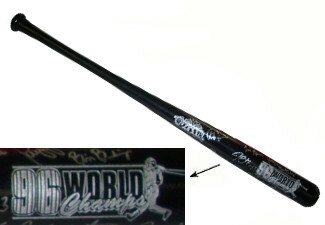 This New York Yankees 1996 World Series Champs Cooperstown Engraved Bat has been signed by Charlie Hayes w/ Last Out 96 WS , Jimmy Key, Darryl Strawberry, Cecil Fielder, Ramiro Mendoza, David Weathers, Mariano Duncan, Jimmy Leyritz, Tim Raines, Rickey Bones, Luis Sojo, Brian Boehringer. MAB Hologram and Certificate of Authenticity from Athlon Sports. This product was added to our catalog on Monday 28 July, 2014.